After just seven days of the administration of President Donald Trump, a host of measures have been enacted which threaten a myriad of constituencies throughout the country and internationally. 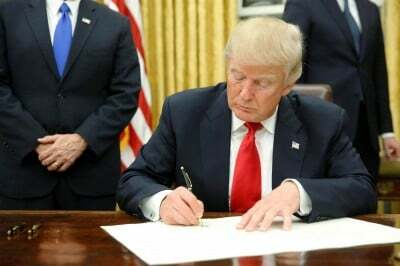 Executive orders and presidential memoranda have been announced relating to the resumption of construction on the Dakota Access Pipeline (DAPL); the building of a wall or fence on the border between the U.S. and Mexico; a ban on people from targeted nations seeking visas and refugee status; muzzling communications from government agencies; threats of withholding federal assistance to municipalities which refuse to turn over people designated as “illegal” by the state; and other actions. Mexican President Enrique Pena Nieto was scheduled to travel to the White House for a meeting with Trump to discuss bilateral relations. On January 26, it was announced that the meeting was cancelled. The administration’s insistence that a wall will be built on the southern border and that Mexico will pay for it has created tensions between the two nations. The Mexican government has rejected such an assertion that it will finance the project eliminating the basis for any normalized relations. People of Latin American descent have been designated as the largest national minority in the U.S. From an historical perspective, the southwest and west coasts of the U.S. were seized from Mexico during a war of annexation in the mid-19th century. Many Mexicans and others U.S. residents, whom many have citizenship, face systematic discrimination and national oppression. Another major executive order lifted a suspension of the construction of the Keystone XL DAPL which is slated to run through lands still controlled by Native people. A massive solidarity movement sprung up in 2016 involving millions across the country and the world. Thousands of people traveled to the Standing Rock lands to serve as “human shields” against attacks carried out by law-enforcement, the military and private security personnel working on behalf of the corporations who are spearheading the pipeline which will transport 500,000 barrels of oil per day. Trump noted that 93 percent of the project has been completed and that it would create jobs for American workers. Yet the total number of positions is only a few thousand and these purported benefits ignore the legitimate concerns of the Indigenous people who say their water supply and other sacred possessions are threatened by the pipeline. It was not clear if Trump was referring to federal civilian employees on military personnel. The National Guard for the state of Illinois could be federalized or regular units of the army could also be deployed in such a threat. No mention was made of the horrendous socio-economic conditions prevailing among African Americans in Chicago and the state of Illinois where they suffer the highest unemployment rate in the country. Drastic cuts in educational, social and municipal services have been implemented while the leading corporations in the U.S. announce the regular increases in their profits. There are precedents for such military deployments extending back decades. In Detroit, Newark, Chicago, Washington, D.C., Los Angeles, and other cities in the 1960s, both National Guard and Airborne Divisions were sent in to put down urban rebellions led by African Americans. Just over the last two years, National Guard forces have been sent into Ferguson (2014), Baltimore (2015), Milwaukee and Charlotte (2016) in the aftermath of African American rebellions sparked by the police killings of civilians. Local police agencies have been supplied with military equipment such as armored personnel carriers, long range acoustical devices, chemical agents, helicopters and sophisticated intelligence technology by the federal government. Under the present regime it is inevitable that the transferal of this hardware will increase. Moreover, Trump’s administration is maintaining that its loss of the popular vote from the November 8 election is a direct result of voter fraud. Trump won in the Electoral College with 306 votes but only earned nearly 3 million less popular votes than his rival Democratic Party candidate Hillary Clinton. Allegations of massive voter fraud are often utilized to further suppress the electoral weight of African Americans and other nationally oppressed groups. Rev. Edward Pinkney of Berrien County, Michigan in 2014 was falsely accused of altering five dates on recall petitions aimed at removing a mayor who was perceived as a functionary of Whirlpool Corporation which is based in Benton Harbor. Rev. Pinkney was charged with felony forgery, tried by an all-white jury and judge and given a 30-120 months sentence in state prison. The removal of the enforcement provisions of the Voting Rights Act of 1965 by the U.S. Supreme Court in the infamous Shelby County v. Holder ruling in 2013 has effectively weakened one of the gains resulting from the Civil Rights Movement of the 1960s. Such an investigation by Trump is clearly politically motivated since no statistical studies have indicated this level of voter irregularities. Since the election of Donald Trump to the White House, the New York Stock Exchange has risen by hundreds of points surpassing the 20,000 mark on January 25. This of course does not translate into an improved standard of living for working people. Nonetheless, the rising stock market indicates Wall Street is satisfied that the Trump program of far-right domestic and foreign policy imperatives are compatible with the unbridled quest for maximum profits by international finance capital. Most neo-fascist movements are led by representatives of the bourgeoisie who pander to the fears of key sections of the working class and middle strata. The Trump cabinet and leading appointees are representative of numerous financial and defense corporations. None of the members of his team have any identifiable history of concern with the plight of the workers and oppressed. This approach to electoral and administration politics has also prompted mass demonstrations and disaffections from the system. Millions of women protested throughout the U.S. and the world on January 21. 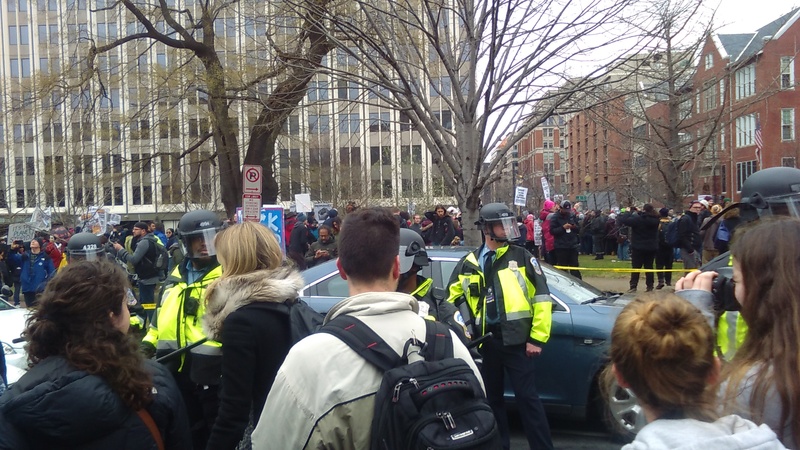 On inauguration day itself, hundreds of thousands demonstrated in the streets surrounding the White House and beyond, where over 200 people were arrested including six journalists. These media workers along with activists are being charged with felony riot. The cell phones of the activists and journalists were confiscated by the Metropolitan D.C. police placing their professional contacts and personal acquaintances in jeopardy of law enforcement targeting. The ascendancy of Trump provides an important opportunity for the building of a broad-based united front of democratic forces including African Americans, Latin Americans, Native peoples, immigrants, women, LGBTQ communities, environmentalists and other working class constituencies. However, this alliance which represents the majority of the population within the U.S. must be based on sound political principles and not opportunism. The rights and demands of the oppressed must by upheld including foreign policy questions such as the dismantling of the military industrial complex, the liberation of Palestine, and the elimination of racist violence and institutionalized discrimination against the people of color communities. This coalition of genuine popular forces should be organized outside the framework of the Democratic Party which represents the same ruling class elements as the Trumpist Republicans and their Wall Street and Pentagon supporters. Spokespersons at the Global Women’s March on January 21 seemed to be suggesting that the Democratic Party can be reconstituted under different leadership which can provide a way forward for the masses. Such illusions could not be further from the reality in which the U.S. and the world are entangled. A revolutionary mass party of the working class and the oppressed is the only solution to the current political and economic crises. The capitalist and the imperialist system led by Washington and Wall Street have nothing to offer the peoples of the globe except further impoverishment and imperialist war.